This is a LIVE auction item, click here to purchase gala tickets! If you are a serious bidder interested in participating in the live auction, please contact our office at 832.581.3592 and we will be happy to facilitate a proxy. 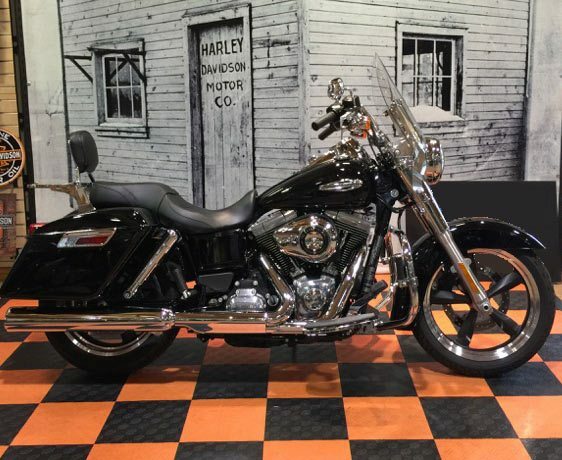 The custom airbrushed 2014 Harley Davidson Dyna FLD Switchback has detachable hard saddlebags and a quick-detach windshield so that the Switchback motorcycle can make the switch from cruising to touring or back in seconds. It comes with hallmark chromed out headlamp nacelle and its mini “ape hanger” handlebars, cast aluminum wheels with full wrap fenders, a Six Speed Cruise Drive transmission, standard Anti-Lock Brakes, and adjustable cigar tube rear shocks. The Harley-Davidson Dyna switchback also comes with a lightweight chassis and cartridge style front forks. Patriotic images have been hand airbrushed on the tank, fenders, and saddlebags in a subtle salute to our nation’s heroes.